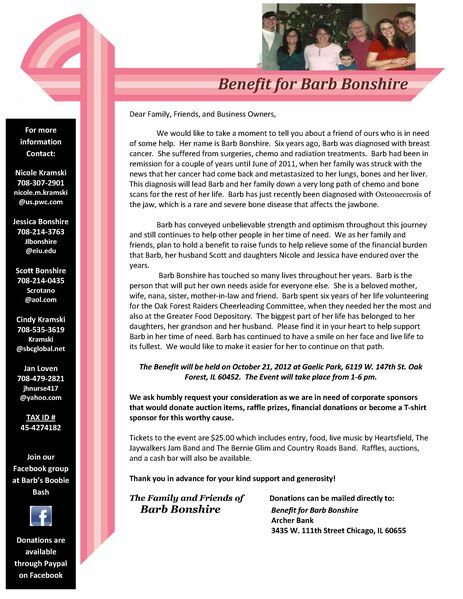 Hey Everyone, I just thought id share this on here to see if anyone was interested in donating anything for my mother in law's cancer benefit. Please read the letter below to get her full story. These are tough times right now, but we are pushing through it. She is an extremely strong woman and if anyone can beat cancer, it is her. Thanks for looking and your comments and/or donations will be much appreciated. For more info or donations please contact the people listed on the left side of the letter or me (Tony @ 708-278-8669). let me know if it is too hard to read. Thank you very much and keep her in you prayers. Chitown-Angler was started on February 10, 2003 and has received 207388222 page views in total since that date.